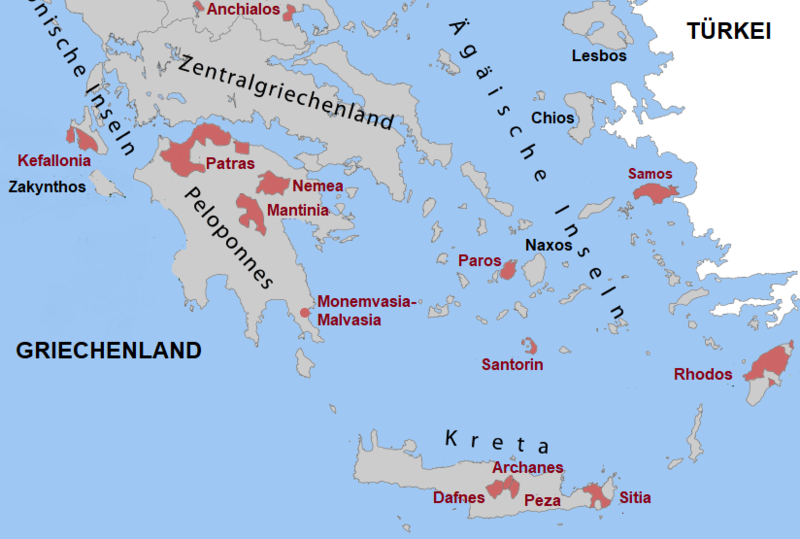 The Greek island with about 470 km² in the eastern Aegean is upstream of the Ionian coast of Asia Minor (Anatolia, Turkey). According to legend, the Argonaut and first Samos king Ankaios brought in 1,000 BC. The Rebstock on the island. Here were born three famous men. The first was the mathematician Pythagoras (580 to 496 BC), to whom the mathematical theorem named after him is attributed. The mathematician Aristarchus (~ 310-250 BCE) was convinced of the heliocentric system with the sun as the center, but was not taken seriously. And the third was the philosopher Epicurus (341-270), whose doctrine of needless, clever, withdrawn enjoyment of life (Epicureanism) later became hedonism was defamed. At the end of the 19th century, wine was exported from Samos to Europe, but it was mainly red wines autochthonous Sorts. Then came the phylloxera and destroyed almost all the vineyards. There was a reconstruction with the Moscato Aspro ( Muscat Blanc ), which today occupies 95% of the vineyards. The approximately 1,800 hectares of vineyards on calcareous rocks are often only two-line terraces on steep slopes up to an altitude of 800 meters. These are mainly at the central mountain Karvounis (1153 m), which is also called Ampelos after the village of the same name on its north side. Other significant areas are on the northeast slopes of Kerkis (1443 m), the western mountain on Samos. Of the POP-sweet wine Samos or Muscat de Samos is next to the Retsina probably the most famous Greek wines. He will unmixed made from the variety Moscato Aspro. The light golden, sweet wine is characterized by an aroma of oranges and spices. The wine is available in four different variants. When Vin doux is the grape must before the fermentation Alcohol is added; the version matured in oak barrels for several years is called Anthemis (old name of Samos). The Vin doux naturel is fermented by Spriten stopped early; the version Vin doux naturel Grand Cru is made from overripe grapes of the best vineyards. This page was last modified at 14 February 2018 at 13:48.